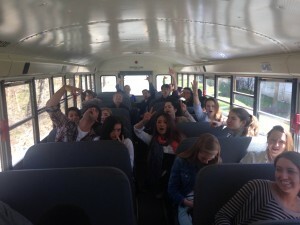 Recently, members of the Widdigers Female Concert Choir and Caterwaulers Male Concert Choir had the opportunity to take a field trip to UMass Amherst, the largest campus involved in the Five College Consortium in the Pioneer Valley. 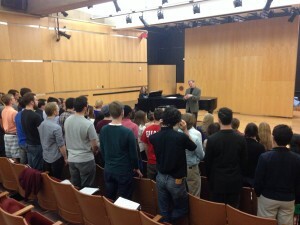 While at UMass, the singers participated in a 100-minute rehearsal with the UMass Chamber Choir, the top auditioned choir in the UMass Choral Program. 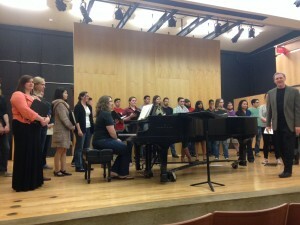 Singing at the collegiate level is an experience that one never regrets or forgets. I, Joshua Harper, Choir Director here at Williston, know this for a fact. We have so many opportunities to make music at Williston, but seeing and hearing it done at the collegiate level is just something that I cannot offer the students on our campus. So I took them off. The day began with all 33 of the students involved in the two auditioned choral ensembles warming up with the members of the Chamber Choir, led by Dr. Tony Thornton, Director of Choral Activities at UMass. 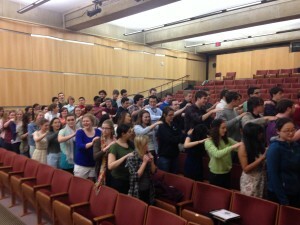 These warm-ups not only got the choirs ready to sing, but instantly provided a segue into advanced vocal techniques typically taught at the collegiate level. Following the warm-up, Dr. Thornton spent time with the singers working on a few pieces from Teller Chorus, which both the Caterwaulers and Widdigers participate in. While working on these pieces, Williston Northampton students sat in between members of the Chamber Choir (comprised of undergraduate and graduate students from degree programs across the campus). Dr. Thornton worked on vowel shaping, dynamic contrast, and text interpretation to better form the pieces that the students were familiar with. 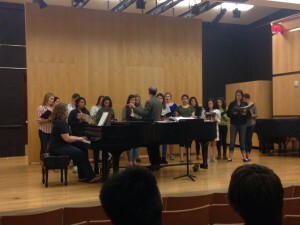 Following this portion of the rehearsal, Dr. Thornton brought the Chamber Choir up on stage and had them perform a few of their pieces for the students. 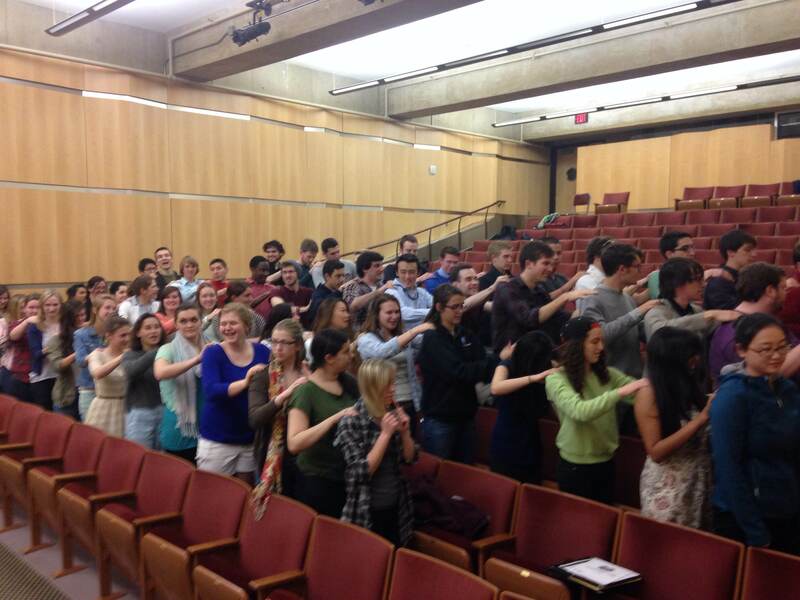 The UMass Chamber Choir is an exceptional ensemble, and were selected to perform this past February at the 2014 Eastern Division American Choral Director’s Association Conference in Baltimore, a very high honor. Hearing the sounds created by simply 32 voices was outstanding, and really exciting to hear in the beautiful acoustics of Bezanson Recital Hall, where the rehearsal took place. 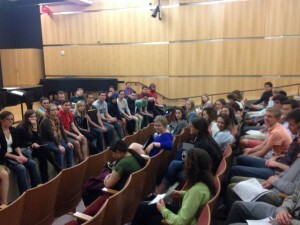 After the performance, Dr. Thornton facilitated a question and answer session. 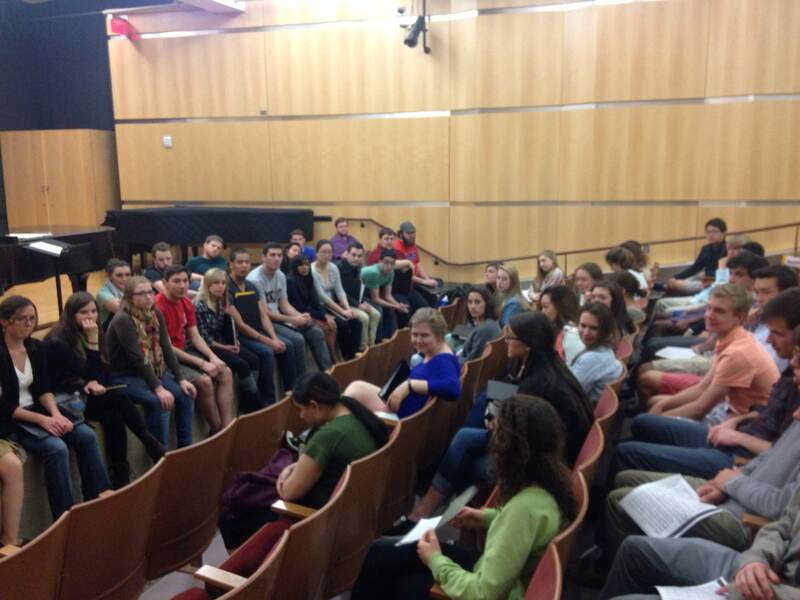 Williston students asked questions regarding time management in college, majoring in something other than music while still singing in an ensemble, and what the audition process for singing at the collegiate level looks like. This was a really great experience for all the students, and members from the Chamber Choir got a chance to share why they do what they do, whether it is majoring in music, or just singing in a choir for the sense of belonging and community that choir can provide. The rest of the afternoon was spent with Dr. Thornton working with the Widdigers and Caterwaulers on their literature for the upcoming May 20th Concert on campus in the Phillips Stevens Chapel. Dr. Thornton got some really amazing sounds out of each of the groups, and it was neat to watch the students have the opportunity to work with a conductor of Dr. Thornton’s caliber. The field trip wrapped up with a private performance by the UMass Hexichords (of which 3 of the group’s members sing in the Chamber Choir). 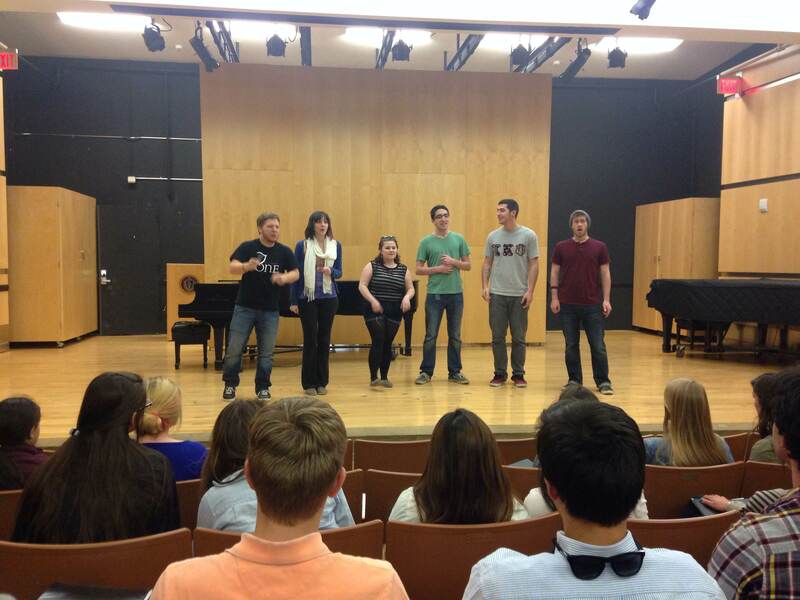 This top notch collegiate a capella group recently placed 2nd in the ICCA Northeast Semi-Finals. They are ranked #21 in the nation. Their extremely high energy performance was very entertaining, and certainly a neat way to see another singing opportunity afforded to students at the collegiate level. 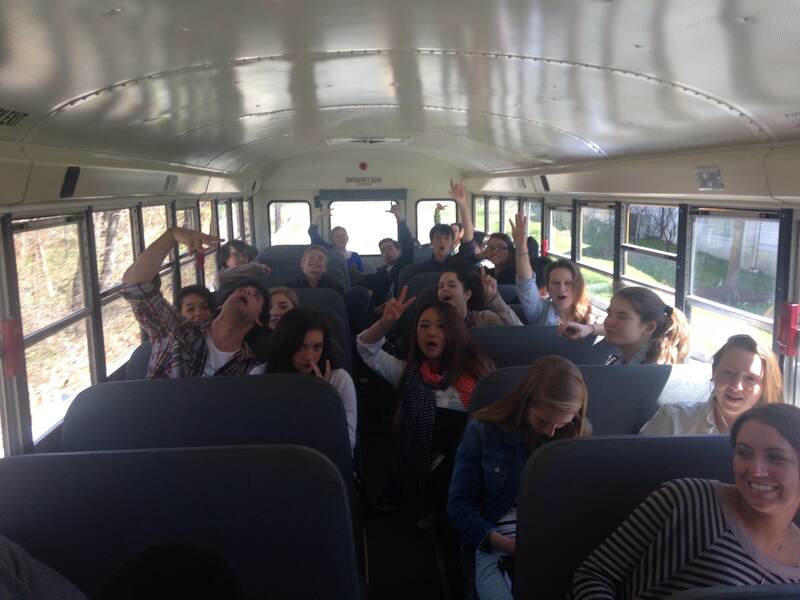 All in all, it was a really exciting day for the students from Williston Northampton, and provided a boost of energy as the students are learning their repertoire for the upcoming May 20th Concert titled “Earth Song: Music From Across the Globe”. It was a great trip from my vantage point, but also as just a lover of choral music myself. The fact that Williston Northampton is situated so close to the Five College area provides exciting opportunities for our campus and department, and hopefully this will not be the last of the collaborations between our ensembles and some of theirs.